Glass calm conditions on Sunday saw Geelong and the Bellarine Peninsula’s boat ramps getting an absolute work out. Offshore from Barwon Heads, Mako Sharks were high on the agenda with those drifting in 50-70m of water finding reasonable numbers. While waiting for a shark, bottom bashing with baits proved effective with snapper to 6kg on the chew. Kingfish were somewhat elusive but when they switched on all tactics have been working, recently the later afternoons have seen them come to the surface and feed more aggressively. Casting 100 to 140mm stick baits into the surface commotion is by far one of the most exciting ways to tangle with a Kingfish. Inside the Barwon Estuary there was no shortage of smaller model Australian Salmon, Silver Trevally & Mullet which were banked all along the Sheepwash. Some keen anglers also had success on Mulloway fishing further up the Sheepwash & Thunderbolt. Dropping fresh or live baits into the deeper holes on the tide changes accounts for larger mulloway this time of the year. Queenscliff fished well land based for squid with Bell Reef and the main pier being the go to locations. Larger jigs in size 3.5 worked best with bag limit captures possible. The Harbour was another Silver Trevally hot spot on the top of the high tide. Soft plastics rigged on a 1/6oz jig head saw anglers land more fish. Over at St Leonards whiting started to appear in more numbers at the popular 'Bourke St'. Make sure you have some tidal flow in the area as the whiting bite more aggressively. Inside Swan Bay on a slack tide, anglers found nice sized Flathead & Garfish then once the tide started running whiting came on the bite. Around the corner at Clifton Springs, anglers reported a mixed bag of flathead, whiting and squid. Pinkie snapper to 3kg have appeared in excellent numbers on the spoil grounds. Casting soft plastics at first or last light is the way to go. Make sure you have a shot at this as their numbers will thin out as the season draws to a close. Inside Corio Bay again Pinkie Snapper are in huge numbers along with the odd large Black Bream. Heading down the southwest, Warrnambool had a fantastic run of Southern Bluefin Tuna just out from the boat ramp. Small skirted lures did the trick along with small profile stick baits. The Hopkins River also saw sensational bream fishing for both bait and lure. On the freshwater scene trout have started to pop back up with Lake Purrumbete producing good sized brown trout trolling Tassie Devils along the east bank. Purrumbete is also the place to boat a feed on redfin. Next door at Lake Bullen Merri, Chinook Salmon have responded to bait fished down deep with the average salmon about 1.2kg. Redfin are still hitting spinners along the Barwon River with the section of river up from Breakwater the best for larger fish. 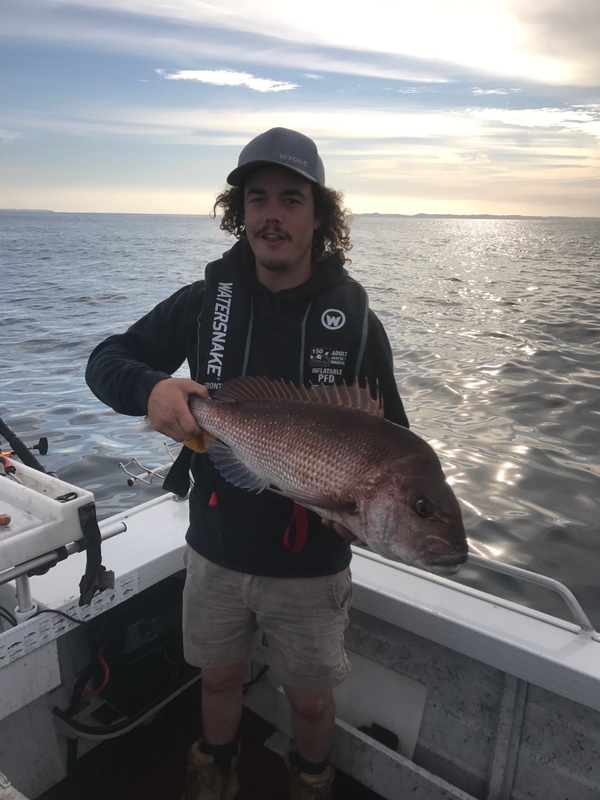 Next week get casting those soft plastics around the Geelong Waterfront and spoil grounds out off Clifton Springs for pinkie snapper and maybe even something a bit larger. Kingfish are still a solid option out off Barwon Heads. If you’re up for a drive, head to Lake Purrumbete in search of trophy Brown Trout which are not uncommon this time of the year. We are still getting some good reports from down Seymour way. 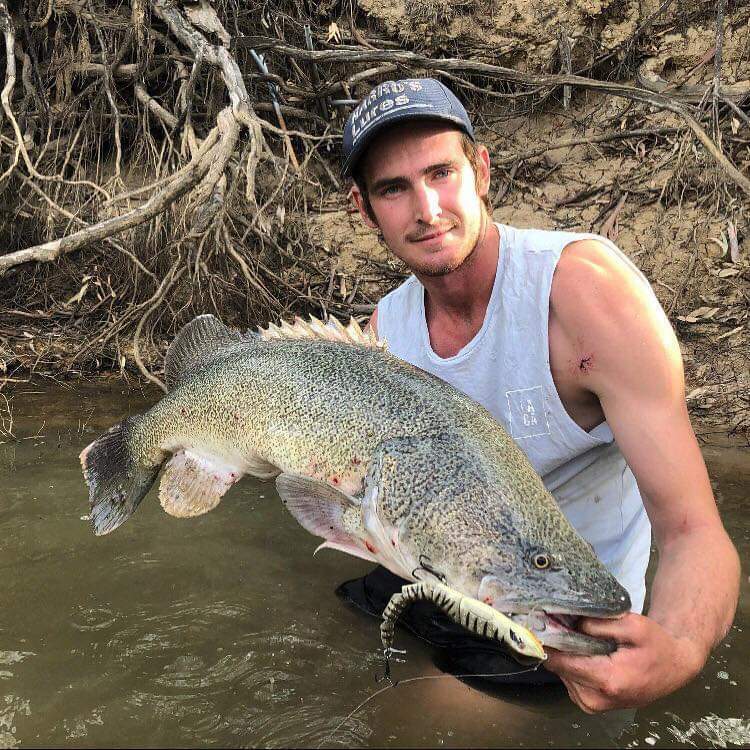 Around the township Redfin have been taken on Hogback style spinners and the occasional nice sized Cod being caught on Baits such as Bardi Grubs, Cheese and big Yabbies. The wineries at Nagambie have quietened a little, but from the Lake to Kirwans Bridge the fishing is still consistent. Trolling 15ft Old Mate's and Casting Surface Lures such as Jackall Pompadour's & Bassman Spinnerbaits along the dropoffs and willow trees is the best method for some good numbers of Cod. Bobbing some Shrimp, small Yabbies or 3-4 inch soft plastics around the willows have also resulted in good Redfin and Yellowbelly, only spend 30 minutes at each snag or tree and keep moving until you find the fish. Below the Weir is looking great, it is dropping a little and the flow is starting to ease, however it is really clear, so its time to get the lures out and get among the Yellowbelly and Cod being caught. Although there are plenty of undersize Cod, the keen early morning fisherman are getting bigger fish either trolling Size 1 StumpJumpers, Codgers & Old Mate's or casting Codger Paddlers, Pompadours and 4D & Bassman Spinnerbaits. Bardi Grubs, Cheese, Chicken Fillets, Big Yabbies and Scrubworms are still producing the bigger numbers of Cod though mostly small, anywhere from Murchison East to Arcadia and Undera to McCoys Bridge are the places to try and all are working well. There have been some ripper fish caught lately, Anthony (pic) nailed a 92cm Cod on a Barambah Bidjiwong and missed plenty more including a massive Cod trolling a AC Invader, they also landed quite a few more around the same size on the Big Zerek Stalker after dark. This area has really started to fire in the last week, so anywhere from Bearii to Ulupna Island is worth a look. The Main Eastern Channel is still fishing really well, bait fishing with Bardi Grubs, Big Yabbies and Cheese being the go in the Euroa Road area's. Some nice sized Yellowbelly have been caught on ZX40's and T/N 60's in Victoria Lake and Kialla Lakes. Small Soft Plastics have been working well in Graigmuir, Lake Mooroopna for Redfin. 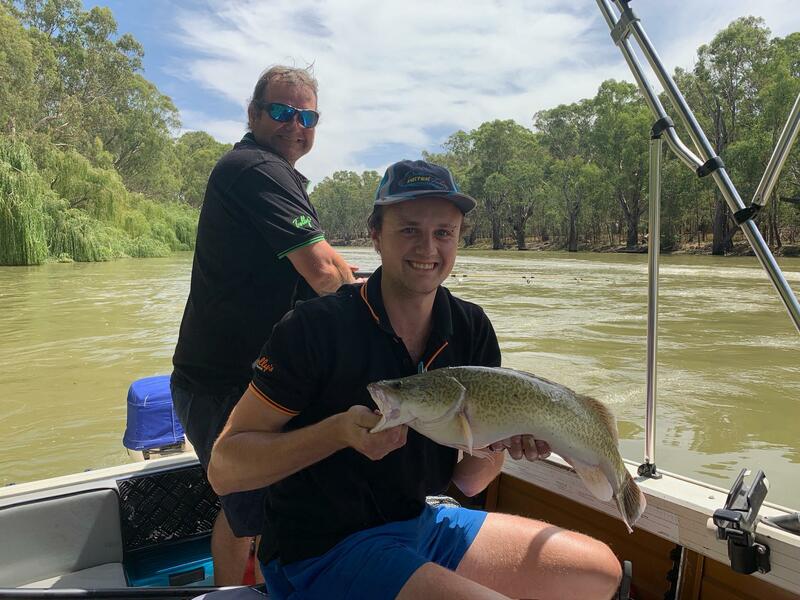 Also plenty of Redfin cruising the channels around Tatura and Kyabram, the classic Worms and Yabbies being the best baits and Hogbacks & Soft Plastics working well also. There are a few Yellowbelly around 40cm plus in the Channels near Waranga Basin; The Main Western, Number 7, Number 6 and the Junction of Number 8 & 9 at McGrath Road are great spots to start. Use Google Maps and try to find a few spots out of the way, try a running size 2 or 3 sinker, size 6 Wide Mouth or Shinner Hook and a Bunch of Worms, hopefully your reels start screaming. Pro Staffers Shane and Nelson (pic) along with Nelson's old man Fons fished the Deni Fishing Comp over the weekend, the fishing was tough with plenty of boat traffic, but Fons manages a 50cm Cod on a Bardi Grub and Nelson snagged a nice 57cm Cod on a big Yabbie and all up was a very enjoyable weekend. Biggest Cod for the comp was a 101cm, with another 100cm fish and a few around the 80cm mark, most caught around the Power Lines and in the 4 knot Zone, maybe due to less wake from boats? We found ours in deeper water with the same theory.